Coppell TV Repair offers a REPLACEMENT SET of boards LJ92-01200A (Y-Main), LJ92-01202A (upper buffer board) and LJ92-01203A (lower buffer board) as shown on the picture. 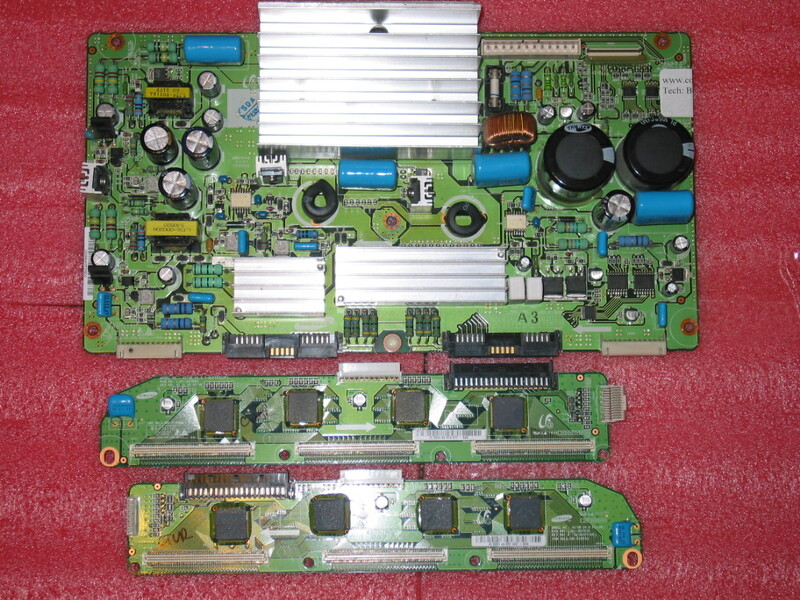 The YSUS board LJ92-01200A is going to be serviced and tested by Coppell TV Repair and the buffer boards LJ92-01202A and LJ01203A are going to be brand new, Samsung OEM buffers of the second generation with four ICs as opposed to the first one which has six ICs. The set is guaranteed to work in any plasma television where Samsung LJ92-01200A Y-Main was used, regardless of what buffers were used along with it. Statistically, this set is everything you will need to get your TV working again ASAP. Statistically means that with hundreds of repair jobs of TVs with those particular boards (see the repair service history for proof of that claim!) we can easily claim that 99.9% of the time when a buffer board has failed replacing those three boards will bring your TV to life and keep it that way for a reasonably long time afterwards. 1) (very reliable) If the TV refuses to power on by only clicking and staying off: disconnect the cable coming from the power supply board to the Y-Main board (the large one on the picture above, sitting to the left side of the TV looking from the back) and try to power on again. If the TV comes on and stays on (without picture) you definitely need this kit. 2) (very reliable) If either of the two buffer boards connected to the Y-Main has a visible signs of burning on either of the 6 ICs on the board, then you definitely need this kit. Another, maybe even better way of checking this is to check the buffers for shortage as displayed in our article (see at the bottom). 3) (not reliable) If the TV comes on and stays on with nothing on the screen then chances are you may need this kit. Chances are, however, that the problem is elsewhere. In this case we advise you to send all three boards for diagnostic service (see links below) or educate yourself more at our blog (again see below). Once you get your TV working you can send back the failty buffer boards and the Y-Main for $30 credit that, if possible, will be returned to the account used to make the payment on eBay (PayPal or credit card; can't return money if payment is made with eCheck, but you can contact us and we can simply issue you ordinary check back). Note we will only issue the credit if the original boards arrive in good physical condition and without traces of repair attempts or other tampering. The whole set is subject to a standard 90 days warranty. Should anything happen with it all you are responsible for is sending the boards back to here. We cover replacement and return shipping costs and/or refund (if necessary). These three boards are thighly coupled meaning a failure in each of them could easily damage the others. This is the reason why they are sold as a set. They just need to move together and unlike many other TV modules they shouldn't be treated individually unless you know the proper testing and installation procedure which avoids the risk of damaging functional boards. Because of that we kindly ask that you avoid experimenting with the boards you receive from us, testing other boards with them etc. We can't control it (unfortunately), but we know it is very risky and you should know it too. So again please do not do it. Copyright © 2019 Coppell TV Repair LLC. All rights reserved.